Last week I looked at the implications of all-time-high valuations on returns in the S&P 500. This week I’ve examined the implications of high valuations on drawdown for stocks in the Russell 1000. I looked at the two most recent crashes–the 2000 to 2002 Dot Com Bust and the 2007 to 2009 Credit Crisis. I backtested the performance of the Russell 1000 Total Return (TR) and its value decile measured using the enterprise multiple (EBITDA / enterprise value — overview of the research on the enterprise multiple here). I lagged the fundamental data by 6 months (so portfolios formed 6/30 in year t use data from 12/31 in year t-1). All portfolios are equally weighted (the 100 stocks in the value decile hold 1 percent of the theoretical portfolio capital at inception and the ~1,000 stocks in the Russell 1000 portfolio hold 0.1 percent of portfolio capital at inception). The Dot Com Bust started in the Russell 1000 TR on September 1st, 2000. When it reached its low on October 9, 2002, two years and one month later, it had fallen 48.09 percent. It would not recover its losses from the September 1st, 2000 peak until October 12, 2006, more than six years and one month later. By contrast, the value decile of the Russell 1000 fared much better. While it initially drew down from September 1st, 2000 more than 22 percent in sympathy with the market, it quickly recovered to make new highs by November that year. It would continue to make new highs until April 17, 2002, at which point it began falling, ending down 36.03 percent on October 9, 2002–the same day the market bottomed. 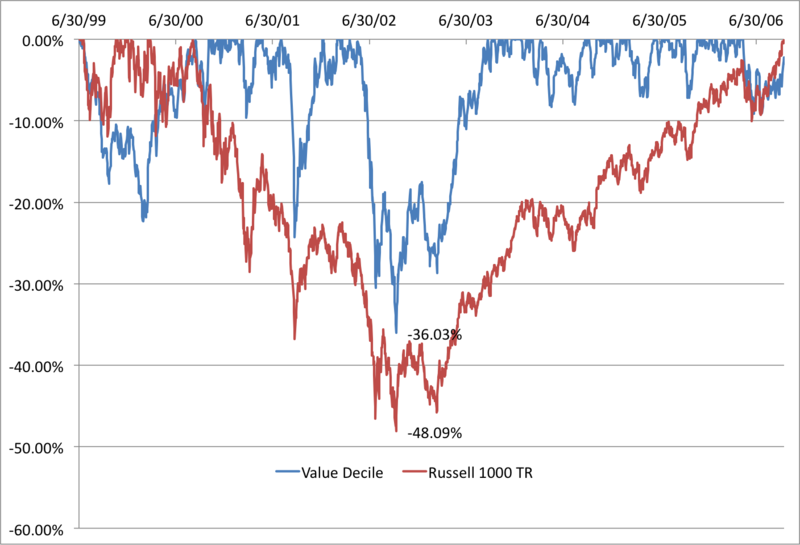 The value decile recovered much faster than the Russell 1000 TR, regaining all its lost ground by September 19, 2003, one year and five months from its prior peak. 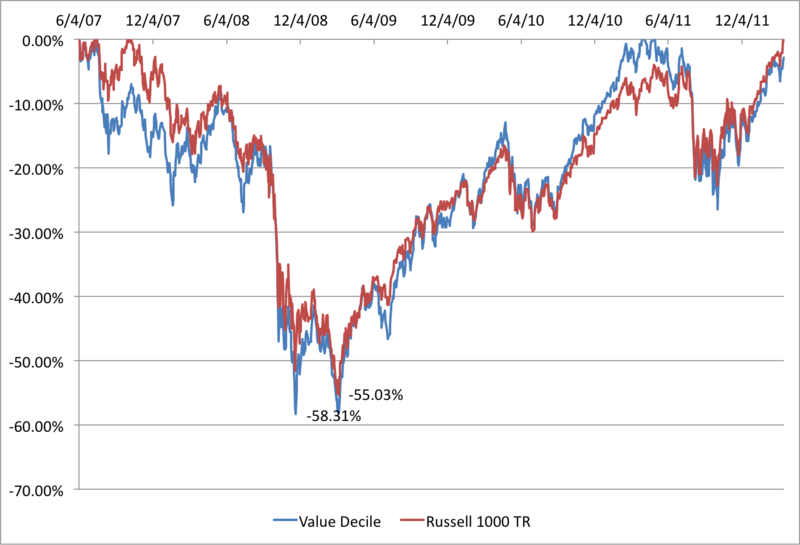 The Credit Crisis actually began in the value decile of the Russell 1000 TR on June 4, 2007. The Russell 1000 itself would not start drawing down until a few months later on October 9, 2007. The value decile would find its low on November 21st, 2008 after falling for two years and four months. From peak to trough, the value decile lost 58.31 percent. It would not fully recover until March 30, 2011, almost three years and ten months from the start of the bust. The Russell 1000 bottomed March 9, 2009, after losing 55.41 percent. It would not make a new peak until March 15, 2012, more than three years after its low, and more than five years and four months its last peak. The shelter offered by the value decile in the Dot Com Bust was missing in the Credit Crisis. If anything, the Credit Crisis hit the value decile harder than the market. It started drawing down four months before the rest of the Russell 1000, and it fell further–58.31 percent versus the Russell 1000’s 55.41 percent. One reason is the relative valuations of the value deciles in the Dot Com Bust and the Credit Crisis. In the early 2000s, value stocks were unusually cheap, with the median of 100 stocks in the value decile of the Russell 1000 yielding (on an EBITDA/EV basis) 17.5 percent in June 1999, 19.5 percent in June 2000, 16.9 percent in June 2001, and 17.2 percent in June 2002. By contrast, the median stock in the Russell 1000 TR yielded 9.0 percent in June 1999, 10.7 percent in June 2000, 10.4 percent in June 2001, and 9.8 percent in June 2002. In the Credit Crisis, the median stock in the value decile yielded 16.75 percent in June 2007, more expensive than at any time in the early 2000s, while the median stock in the market yielded 9.2 percent. The greater yield in the value decile, and the larger spread between the value decile and the market in the Dot Com Bust manifested in a smaller drawdown and a shorter recovery period for the value decile. The slightly smaller yields, and tighter spread in the Credit Crisis led to a larger drawdown, although the value decile did recover much faster than the market, three years and ten months for the value decile versus five years and four months for the market. Valuation doesn’t tell the whole story, but it’s an important component in the performance of portfolios during stock market crashes. High market valuations are one of the factors that precipitate crashes. 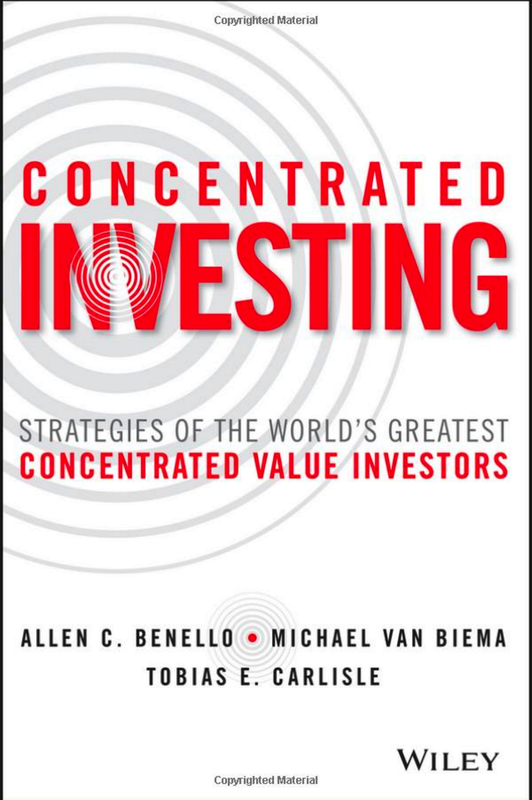 Better value portfolios of stocks sometimes offer a little more protection than overvalued stocks, as they did in the Dot Com bust, but that is unusual. 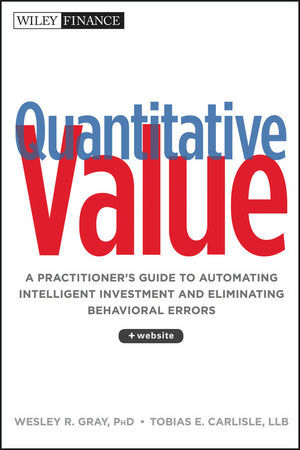 In the ordinary course, correlations go to 1 and everything sells off at the same rate, as it did in the Credit Crisis. Presently, the median stock in the Russell 1000 TR yields just 9.2 percent, while the median stock in the value decile yields almost 16.8 percent. Both are expensive.